In July of 2010, two 10,000-gallon gasoline, one 10,000-gallon diesel, and one 4,000-gallon gasoline USTs were removed from a service station. 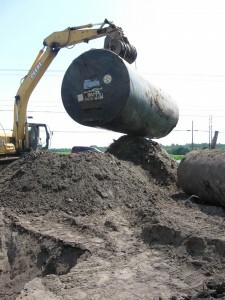 Approximately 188 tons of contaminated soil were excavated during tank removal procedures. Field evidence and analytical results for soil samples indicate that soil contamination was present at the location of the USTs. The closure soil samples collected from beneath and around the tanks and/or lines/dispensers confirmed the presence of petroleum-related contaminants. In January of 2011, groundwater monitoring wells were installed within the former UST basin and dispenser island area. Groundwater samples were collected from the monitoring wells in January of 2011. Groundwater samples confirmed concentrations of petroleum-related contaminants exceeding the state standards. A Phase I Limited Site Assessment (LSA) was completed and submitted to NCDENR in March of 2011. One active water-supply well was located onsite for potable water-purposes. Based on this information in the LSA, NCDENR ranked the site High Risk (H155 D) and requested completion of a Comprehensive Site Assessment (CSA) in May of 2011. The property owner agreed to have the site connected to municipal water and abandon the onsite water-supply well to lower the site ranking from High to Low, thus allowing regulatory closure of the incident. The water line connection and water-supply well abandonment were completed by February of 2012. In March of 2012, NCDENR re-ranked the site as Low Risk (L115D) and requested completion of a Notice of Residual Petroleum (NORP). GMA completed the NORP requirements by filing public notification, abandoning the groundwater monitoring wells, and mailing final documents to NCDENR and our client. NCDENR issued a Notice of No Further Action in May of 2012. The final claim for State Trust Fund (STF) reimbursement was submitted in June of 2012.